Worst Possible Illusion is an intimate look at the creative life and work of one of the art world's most heralded young photographers. Its subject, Brazilian artist Vik Muniz. 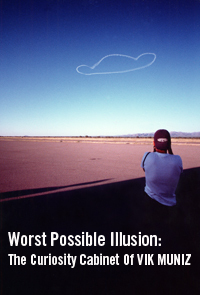 Worst Possible Illusion takes the viewer on a magical, globe-hopping journey designed to amuse, educate, and inspire. We join the artist as he travels from his studio in Brooklyn, New York, to his native Brazil; we journey to Chicago, his first home in the United States, where we find out how working as a gas-station attendant and in a grocery store led to a career as a professional artist; and we travel with him to Arizona, where we witness his take on the classic earthwork.